One of life’s greatest pleasures is sitting in the summer sun watching test match cricket. 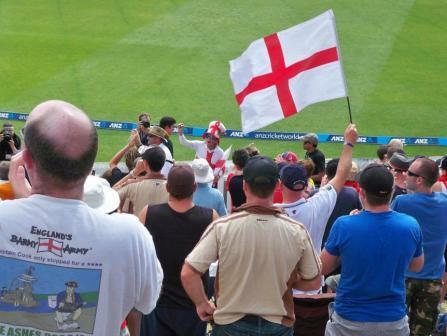 Last weekend I spent two splendid days at Wellington’s Basin Reserve watching the country of my birth (England) take on the country in which I have made my home (New Zealand). While I live in and love New Zealand, I’m not a Kiwi and there is nothing quite like a burst of Jerusalem sung lustily at 10.30am to set an Englishman’s heart racing and make the hairs on the back of your neck stand up. Call me old fashioned, call me a purist if you must. But I only feel this way about test match cricket, the longest version of the game. The one day limited over and Twenty 20 formats leave me a little cold to be honest. T20, like the Sevens version of rugby, stands for everything that is wrong about the world today. Short-term focused, instantly gratifying but ultimately meaningless, forgettable and lacking real quality. American readers may have already given up at the first mention of cricket, wondering how a top level sporting contest can last for up to five days, end in a draw and everyone goes away happy. But if you haven’t, stick with me. This extreme seems to encapsulate where HR often finds itself these days. I believe HR is a long game. You get the best results over the long term, not from a few hours of bashing the ball around the park to get a quick result. As entertaining and fun as that may be, it’s not real HR. Too often we are expected or demanded to produce immediate results, along with the new senior hires in key positions. I have just been reading some articles on change management. These are all along the lines of “change management no longer works because…blah, blah.” The problem is we have come to expect immediate results in every facet of life and think a change initiative has failed if it doesn’t realise immediate benefits and create happy people. Unfortunately, we have become obsessed by short-term thinking, or busyness rather than business. We need immediate results and instant gratification. People say technology and pace of life is to blame. It isn’t. It’s just that we humans haven’t yet fully adapted our thinking and behaviour to incorporate it properly. We think ease of access means speed and a quick result. Move on to the next thing. But the old saying that good things take time is as true today as it has always been. Give me a properly prepared and cooked meal over a microwave version any day. It just tastes so much better. Sometimes in HR we also just need to keep chanting the same message until we see a breakthrough. A moment when the whole game changes. Sometimes we win, sometimes we lose but business is all a bit of a game anyway and when we do manage to make a long term difference it is incredibly rewarding. So to finish with another cricketing analogy, don’t be one of that army of HR professionals who just chase the quick runs and then get out. Stay at the crease as long as you can. That’s the real sign of skill and application. Now that’s not so barmy is it? Finally, a couple of housekeeping issues as trainers like to say. Last week sadly saw the demise of jobs.co.nz. Now I don’t know what went wrong, I’m not close to anyone who was working there and I’m not going to speculate. But from a distance, it seemed like they made one or two bad business decisions along the way as start ups often do. It’s a timely reminder that it’s often a fine line between success and failure in business and it’s still tough to earn a recessionary dollar. However, all credit to the Jobs crew. They certainly put the social into New Zealand recruitment and were a breath of fresh air on the job board front. Well done guys for giving it a go and daring to be different. You will be missed and I sincerely hope everyone there goes onto bigger and better things. I mentioned taking part in the Relay for Life a couple of weeks back. Many thanks to everyone for your messages of support and for those who donated money to the cause. We were part of a great team and it was very much appreciated.